It’s not too unusual to get a wheat cent in your change, and every couple of years I’ll even find that I’ve gotten a Mercury dime or buffalo nickel. Coins are hardy things, and tend to move from pocket to change drawer to pocket for years before they wear out and go to the proverbial Great Couch Cushion In The Sky. 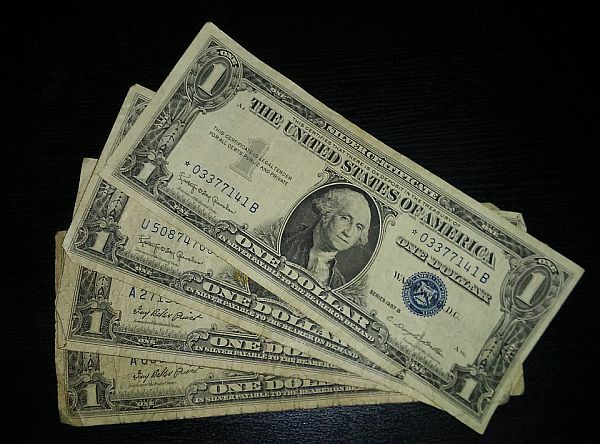 These aren’t especially valuable – they printed them by the millions, and all four of these come from the 1935 and 1957 series, which are apparently the most common series of all – but they’re still very odd things to have come out of a cash drawer in 2015. I am left very curious indeed as to how they’ve managed to avoid being deposited at a bank and returned to the nearest mint for replacement and destruction.